Many people feel the student loan debt pinch when it comes to buying a home. 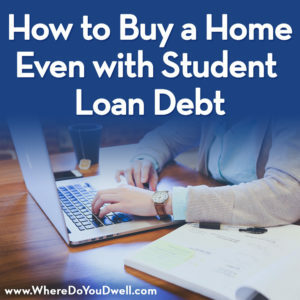 One reason many people put off their home search is because they think they won’t be able to buy anything with the amount of student loans they have to repay. However, don’t automatically assume you’re facing a roadblock to homeownership if you have this debt. There are ways to work with lenders and assistance programs to make your first home purchase a reality — and even more affordable despite your student loans. For example, the “You’ve Earned It” program in Maryland is one we’ll highlight below. It’s the amount of recurring debt you have monthly compared to your gross monthly income. In a lender’s eyes, your DTI is more important than your credit score or how much money you have for a down payment. And that’s where your student loan debt combined with a mortgage can tip the scales in the DTI ratio, pushing it higher and ultimately affecting your ability to get approved by a lender. Lenders want to see a low DTI. Most financial experts recommend a DTI between 33-36% — it’s considered a good balance between debt and income. Some lenders will consider a maximum DTI of 43%. That may make many of you uncomfortable, and we agree. Remember that what a lender says you can qualify for can be much higher than what you are comfortable spending each month! The 36% is the back-end ratio and equals your entire monthly housing costs expenses (principal, interest, mortgage insurance, property taxes) plus other debts (student loan, car loan, credit cards, etc.) divided by your gross monthly income. It’s the DTI we explained above, and you should try not to go above 36%. The 28% is part of the front-end ratio and equals your monthly housing expenses (principal, interest, mortgage insurance, property taxes) divided by your gross monthly income. Your other recurring debt is not included. Again, a lender doesn’t want to see it above 28%. Lengthen your payback term – spread out your loan repayment over more years to lower your monthly debt obligation. However, this will increase you long-term interest payments so carefully weigh the pros and cons of this strategy. See if you can negotiate a lower minimum monthly repayment requirements on your credit cards, especially one that is on the higher side. Some credit card companies are willing to work with you if you have a good credit score and payment history. Steer clear of lenders whose underwriters just look at your entire balance of student loan debt and not your current monthly payments compared to your income. You will likely not qualify for a mortgage loan with them if you have a substantial balance. It won’t matter to them even if you have lowered your monthly payments with a graduated repayment plan – they will calculate your DTI by using the percentage of your total loan balance. These programs below will help jump start your ability to make homeowership a reality. The home must be located in a Sustainable Community (a wide range of localities marked in orange on this map. Other conditions include: You must complete homebuyer education. You must use an approved lender. Condo buyers will need to purchase in a FHA or Fannie Mae-approved building. SmartBuy Program — This Maryland program is different since it’s focused on a specific and limited number of eligible properties that have been selected by the Department Real Estate Owned (REO). There’s not as much flexibility in the selection of a home, but this could be an option for some buyers. So take a look at its current list of homes available for sale. You must live in the house for at least 5 years to have your student loan debt forgiven. There are several government programs that offer loans that are better for borrowers with student loans and on a tighter budget. Each has different requirements and may not be a good option for you. However, one may make your homeownership dreams comes true. FHA Loan – Usually allows a 43% DTI but will sometimes allow a higher DTI on case-by-case basis. You may already be handling sizeable monthly housing costs because of the higher rents in the DC metro area. You now may be ready to invest that money in your own home and not a rental. But first, honestly answer questions about yourself. Do you have a good job with steady income with expectations of more earning power? Do you plan to remain in the area for the next 5 years minimum? Have you been paying back your student loans each month and have some money saved? Is your DTI not too high and you’re willing to find an assistance program that could help? As a first-time buyer with student debt, you may need to lower your expectations for your first home, and perhaps change locations or buy a townhome instead of a single-family house.